By the 1920s John B. Watson had left academic psychology and other behaviorists were becoming influential, proposing new forms of learning other than classical conditioning. Perhaps the most important of these was Burrhus Frederic Skinner. Although, for obvious reasons he is more commonly known as B.F. Skinner. Skinner's views were slightly less extreme than those of Watson. Skinner believed that we do have such a thing as a mind, but that it is simply more productive to study observable behavior rather than internal mental events. Skinner believed that the best way to understand behavior is to look at the causes of an action and its consequences. He called this approach operant conditioning. Skinner's theory of operant conditioning was based on the work of Thorndike (1905). Edward Thorndike studied learning in animals using a puzzle box to propose the theory known as the 'Law of Effect'. Skinner is regarded as the father of Operant Conditioning, but his work was based on Thorndike’s law of effect. Skinner introduced a new term into the Law of Effect - Reinforcement. Behavior which is reinforced tends to be repeated (i.e. strengthened); behavior which is not reinforced tends to die out-or be extinguished (i.e. weakened). 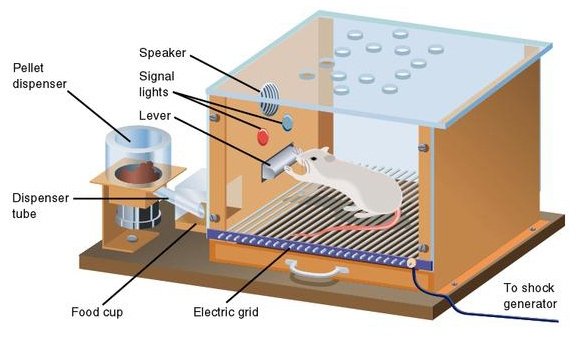 Skinner (1948) studied operant conditioning by conducting experiments using animals which he placed in a “Skinner Box” which was similar to Thorndike’s puzzle box. B.F. Skinner (1938) coined the term operant conditioning; it means roughly changing of behavior by the use of reinforcement which is given after the desired response. Skinner identified three types of responses or operant that can follow behavior. Skinner coined the term operant conditioning; it means roughly changing of behavior by the use of reinforcement which is given after the desired response. Skinner identified three types of responses or operant that can follow behavior. • Neutral operants: responses from the environment that neither increase nor decrease the probability of a behavior being repeated. 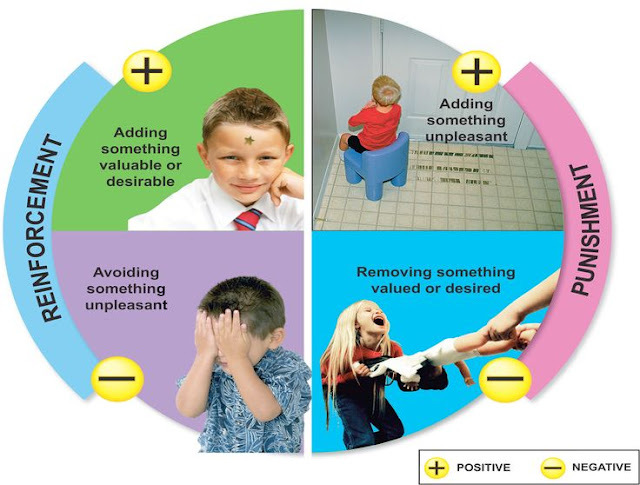 • Reinforcers: Responses from the environment that increase the probability of a behavior being repeated. Reinforcers can be either positive or negative. • Punishers: Response from the environment that decrease the likelihood of a behavior being repeated. Punishment weakens behavior. We can all think of examples of how our own behavior has been affected by reinforcers and punishers. As a child you probably tried out a number of behaviors and learnt from their consequences. For example, if when you were younger you tried smoking at school, and the chief consequence was that you got in with the crowd you always wanted to hang out with, you would have been positively reinforced (i.e. rewarded) and would be likely to repeat the behavior. If, however, the main consequence was that you were caught, caned, suspended from school and your parents became involved you would most certainly have been punished, and you would consequently be much less likely to smoke now. Skinner showed how positive reinforcement worked by placing a hungry rat in his Skinner box. The box contained a lever in the side and as the rat moved about the box it would accidentally knock the lever. Immediately it did so a food pellet would drop into a container next to the lever. The rats quickly learned to go straight to the lever after a few times of being put in the box. The consequence of receiving food if they pressed the lever ensured that they would repeat the action again and again. Positive reinforcement strengthens a behavior by providing a consequence an individual finds rewarding. For example, if your teacher gives you £5 each time you complete your homework (i.e. a reward) you are more likely to repeat this behavior in the future, thus strengthening the behavior of completing your homework. The removal of an unpleasant reinforcer can also strengthen behavior. This is known as negative reinforcement because it is the removal of an adverse stimulus which is ‘rewarding’ to the animal. Negative reinforcement strengthens behavior because it stops or removes an unpleasant experience. For example, if you do not complete your homework you give your teacher £5. You will complete your homework to avoid paying £5, thus strengthening the behavior of completing your homework. Skinner showed how negative reinforcement worked by placing a rat in his Skinner box and then subjecting it to an unpleasant electric current which caused it some discomfort. As the rat moved about the box it would accidentally knock the lever. Immediately it did so the electric current would be switched off. The rats quickly learned to go straight to the lever after a few times of being put in the box. The consequence of escaping the electric current ensured that they would repeat the action again and again. In fact Skinner even taught the rats to avoid the electric current by turning on a light just before the electric current came on. The rats soon learned to press the lever when the light came on because they knew that this would stop the electric current being switched on. These two learned responses are known as Escape Learning and Avoidance Learning. Punishment is defined as the opposite of reinforcement since it is designed to weaken or eliminate a response rather than increase it. Like reinforcement, punishment can work either by directly applying an unpleasant stimulus like a shock after a response or by removing a potentially rewarding stimulus, for instance, deducting someone’s pocket money to punish undesirable behavior. Note: It is not always easy to distinguish between punishment and negative reinforcement. Behavior modification is a set of therapies / techniques based on operant conditioning (Skinner, 1938, 1953). The main principle comprises changing environmental events that are related to a person's behavior. For example, the reinforcement of desired behaviors and ignoring or punishing undesired ones. This is not as simple as it sounds — always reinforcing desired behavior, for example, is basically bribery. There are different types of positive reinforcements. Primary reinforcement is when a reward strengths a behavior by itself. Secondary reinforcement is when something strengthens a behavior because it leads to a primary reinforcer. The token economy is a system in which targeted behaviors are reinforced with tokens (secondary reinforcers) and are later exchanged for rewards (primary reinforcers). Tokens can be in the form of fake money, buttons, poker chips, stickers, etc. While rewards can range anywhere from snacks to privileges/activities. Token economy has been found to be very effective in managing psychiatric patients. However, the patients can become over reliant on the tokens, making it difficult for them once they leave prisons, hospital etc. Teachers use token economy at primary school by giving young children stickers to reward good behavior. Behavior modification therapy is much used in clinical and educational psychology, particularly with people with learning difficulties. In the conventional learning situation it applies largely to issues of class- and student management, rather than to learning content. It is very relevant to shaping skill performance. A simple way of giving positive reinforcement in behavior modification is in providing compliments, approval, encouragement, and affirmation; a ratio of five compliments for every one complaint is generally seen as being the most effective in altering behavior in a desired manner. Looking at Skinner's classic studies on pigeons’ behavior we can identify some of the major assumptions of behaviorists approach. • Psychology should be seen as a science, to be studied in a scientific manner. Skinner's study of behavior in rats was conducted under carefully controlled laboratory conditions. • Behaviorism is primarily concerned with observable behavior, as opposed to internal events like thinking and emotion. Note that Skinner did not say that the rats learnt to press a lever because they wanted food. He instead concentrated on describing the easily observed behavior that the rats acquired. • The major influence on human behavior is learning from our environment. In the Skinner study, because food followed a particular behavior the rats learned to repeat that behavior, e.g. classical and operant conditioning. • There is little difference between the learning that takes place in humans and that in other animals. Therefore research (e.g. classical conditioning) can be carried out on animals (Pavlov’s dogs) as well as on humans (Little Albert). Skinner proposed that the way humans learn behavior is much the same as the way the rats learned to press a lever. So, if your layperson's idea of psychology has always been of people in laboratories wearing white coats and watching hapless rats try to negotiate mazes in order to get to their dinner, then you are probably thinking of behavioral psychology. Behaviorism and its offshoots tend to be among the most scientific of the psychological perspectives. The emphasis of behavioral psychology is on how we learn to behave in certain ways. We are all constantly learning new behaviors and how to modify our existing behavior. Behavioral psychology is the psychological approach that focuses on how this learning takes place. Operant conditioning can be used to explain a wide variety of behavior, from the process of learning, to addiction and language acquisition. It also has practical application (such as token economy) which can be applied in classrooms, prisons and psychiatric hospitals. However, operant conditioning fails to taken into account the role of inherited and cognitive factors in learning, and thus is an incomplete explanation of the learning process in humans and animals. For example, Kohler (1924) found that primates often seem to solve problems in a flash of insight rather than be trial and error learning. Also social learning theory (Bandura, 1977) suggests that humans can learn automatically through observation rather than through personal experience. The use of animal research in operant conditioning studies also raises the issue of extrapolation. Some psychologists argue we cannot generalize from studies on animals to humans as their anatomy & physiology is different from humans, & they cannot think about their experiences and invoke reason, patience, memory or self-comfort. Keller, W. (1924). The mentality of apes. Skinner, B. F. (1938). The Behavior of Organisms: An Experimental Analysis. New York: Appleton-Century. Skinner, B. F. (1948). Superstition' in the pigeon. Journal of Experimental Psychology, 38, 168-172. Skinner, B. F. (1953). Science and human behavior. SimonandSchuster.com. Thorndike, E. L. (1905). The elements of psychology. New York: A. G. Seiler.